Fruits and vegetables are fresh, in season, and are picked at the peak of ripeness. They contain the greatest amount of vitamins and minerals when they are just harvested. Produce found in the grocery store is liable to have traveled hundreds of miles after being picked prematurely. The average carrot travels 1,838 miles from its harvesting source to your dinner table. In that time it takes to reach its destination, grocery store produce has lost about 45% of its nutrient composition. 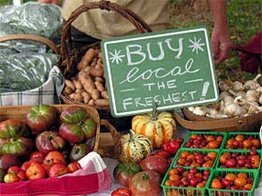 By buying local produce, you would be decreasing that transit time and increasing the amount of nutrients obtained. Animals grown locally are typically better cared for than the animals that are raised on a commercial-scale. With better treatment and a better diet, local meats are typically leaner and have less fat. The fat that they do have is higher in omega-3’s, which have been suggested to be extremely beneficial for the human body. Local produce will lack the heavy chemicals and pesticides used by commercial farms. Pesticides are a potential carcinogen so if there are any residues leftover on produce then that will negatively impact your health. Local food has a significantly less chance of containing harmful food pathogens. The lack of longer-term transportation time does not allow harmful pathogens to grow and spoil the crop. Also, you will know where your food is coming from and how it was grown or raised by buying it locally. Overall, buying your food locally, whether it is from your neighbor or at the farmers market, connects you with the people in your area and helps to develop a greater sense of community.